On Wed­nes­day, the sen­at­or from Ver­mont told a small crowd at Wash­ing­ton’s Masjid Muhammad (also known as “the Na­tion’s Mosque”) that “dem­agogues” try­ing to di­vide the coun­try are act­ing in “shame­ful” ways in the wake of the ter­ror­ist at­tacks in Par­is and San Bern­ardino, Cali­for­nia. He then stressed the strides the coun­try has made to over­come hatred and dis­crim­in­a­tion in the past. Sit­ting at a table with a co­ter­ie of re­li­gious lead­ers from around D.C.—Im­am Talib Shareef of the Na­tion’s Mosque, Rep. Keith El­lis­on, Rev. 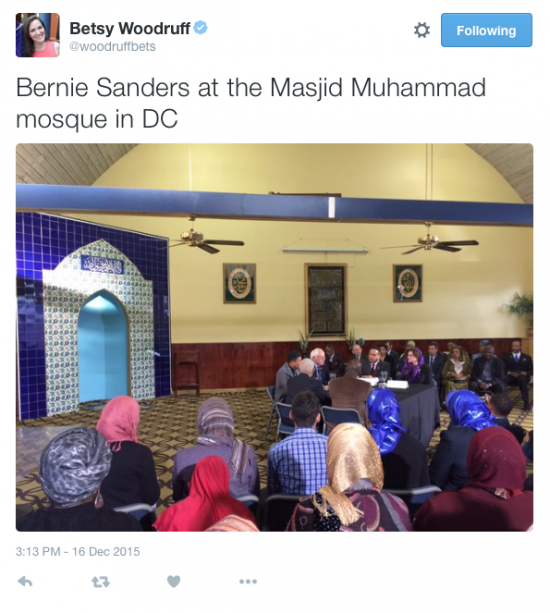 Re­gin­ald Green, Rabbi Batya Stein­hauf, and Chap­lain Ab­dul-Rasheed Muhammad of the Vet­er­ans Af­fairs De­part­ment—Sanders spoke about the his­tory of bigotry and urged Amer­ic­ans to avoid let­ting fear di­vide them. “It’s no secret that throughout the world and in our own coun­try, we have seen cen­tur­ies of bigotry and in­tim­id­a­tion, some­times with un­speak­able res­ults,” Sanders said, list­ing the Holo­caust, Rwanda, and Bos­nia as prime ex­amples of times that hate­ful rhet­or­ic has caused un­ne­ces­sary and tra­gic vi­ol­ence. He de­nounced the re­cent rhet­or­ic of “dem­agogues” when it comes to Muslim im­mig­ra­tion, call­ing out GOP real-es­tate mogul Don­ald Trump by name and say­ing that anti-Muslim com­ments have promp­ted an in­crease in hate speech across Amer­ica.